You might think that, as an editor, I would endorse a plan to rewrite Shakespeare in modern English. After all, as the advocates of this undertaking argue, Shakespeare’s language cannot be understood by contemporary audiences, and our profession is all about understanding. However, this has little to do with editing. If Shakespeare’s writing comes across as obscure, most of the blame lies with his present-day patrons and their educators; a small fragment can be ascribed to his artistic method. A lot of great literature, especially poetry, can be murky and reading it forces us to think. Shakespeare did not set out to bewilder anyone. I have not seen this and I don’t want to. I imagine it would be somewhat like replacing the Group of Seven’s paintings with snapshots, although I realize there are many excellent landscape photographers. Besides, I think I’ve had a preview with modern translations of the Bible. It is impossible now to experience in an English church the enveloping amalgam of tradition, intelligence, beauty, clarity of purpose, intensity of conviction and plangent, heart-gripping godliness which is the experience of page after page of the King James Bible. Nothing in our culture can match its breadth, depth and universality, unless, curiously enough, it is something that was written at exactly the same time and in almost exactly the same place: the great tragedies of Shakespeare. Modern translations simply don’t cut it, and they dominate the 900 or so English versions of the Bible. I have only a few of these renditions on my shelves, but there they stay while I read the KJV. I know my original Shakespeare will get the same preference. Previous “Wasted Words” post: Considering the Case for Verbosity. 4 Responses to "Wasted Words: Don’t Meddle With Shakespeare"
Will, I’m dubious about the Shakespeare project too, though it’s worth noting that the playwrights commissioned include some excellent, interesting writers.Shakespeare’s works have lent themselves to many reworkings and adaptations, and while some have been duds, some have been delightful new works in their own right. This project doesn’t take the reworking in a direction that sounds very promising, but I personally won’t dismiss anything I haven’t seen. …aaaand I see I called you “Will.” I’m so sorry! Clumsiest typist in town. Thanks, Wilf, for a thought-provoking post. And thank you, Elizabeth, for sharing that very informative article about the writing of the King James Bible. It reminds us that the goals of today aren’t always so different from the goals of four centuries ago! On the lighter side, others have already moved beyond plain-language Shakespeare. 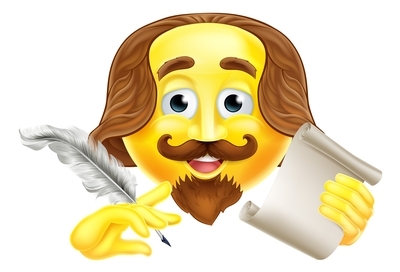 Check out OMG Shakespeare’s srsly Hamlet or YOLO Juliet (aka the texting versions). I haven’t laughed so hard in a long time.